Ok so the last class of term rolls around and we're dealing with temperatures in excess of 30°C! That meant we did a different class to what should have been a bouting practice class, because I wasn't going to let people armour up in that sort of weather. So what we did was look at some basic concepts behind spadone versus single handed sword. It's really an applied class for the drilling work we've been doing for weeks. 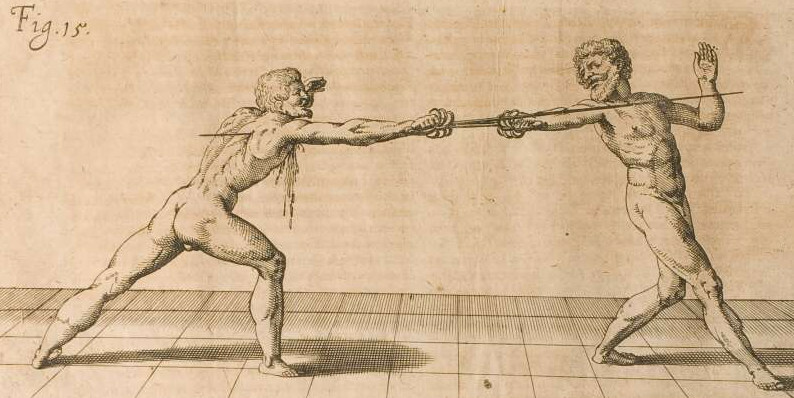 Attacker with spadone, opponent with single handed sword. Attacker throws mandritto from Right Guard, Point Behind. Opponent parries with Guardia di Testa. Blow fails, attacker retreats back out of distance. This first drill is about showing how the guy with a single handed sword must defend themselves using a committed parry structure. The force behind the spadone blow will smash through any improperly formed guard. What the students learnt here is that fully committed defensive structure gave the spadone wielder a free tempo to redouble their blows, which is what the next drill is all about. As we see the extension into the parry, beat sword to left by pushing pommel under arm to throw mandritto falso tondo. Rebouble with tondo to head or body. Attacker retreats out of measure. So what we saw here was the ease with which we could defeat the committed parry. The students then decided that the committed parry was a sub-optimal solution for the swordsman, so they decided they'd try a beat parry instead, stepping into the spadone blow to meet it before it comes to full force. Opponent parries with mezzo mandritto, gathering or passing forward to meet the blow. Opponent attempts to riposte with riverso to head. As we see the forward movement into the parry, beat sword to left by redirecting the mandritto towards the debole of the opponent's sword. Rebouble with tondo to head or body. The students suddenly realised that the spadone has superior leverage, and the ease with which you could redirect the blade meant that the mezzo mandritto was not a safe parry at all. It was at this point one bright spark said that it was impossible to get the forte into the parry with a mezzo mandritto, so we should parry stepping in with the hanging parry instead. So we had a look! Looking to be able to close with a hanging parry, we had the opponent switch to Coda Lunga Stretta, which allowed them to gether in or pass in with Guardia d'Alicorno as the parry, which continues as a tramazzone to riposte to the head. Attacker with spadone, opponent with single handed sword in Coda Lunga Stretta. Opponent parries with Guardia d'Alicorno, gathering or passing forward to meet the blow. Opponent throws tramazzone to riposte to the head. As we see the forward movement into the parry, redirect the mandritto towards the opponent's leg, cutting through the debole of the opponent's sword. Rebouble with tondo to head or body. By redirecting the mandritto towards the leg, aiming to cut through the opponent's debole, we end up with a huge leverage difference. That difference is the oppoenent's thumb trying to oppose the lever we have between our two hand with the spadone hilt. It's an order of magnitude in difference, and the student's all found that their parry collapsed under the redirected attack. This redirected attack was effectively taking people off at the knee, and they found it disturbing how easily the redirection could be done. 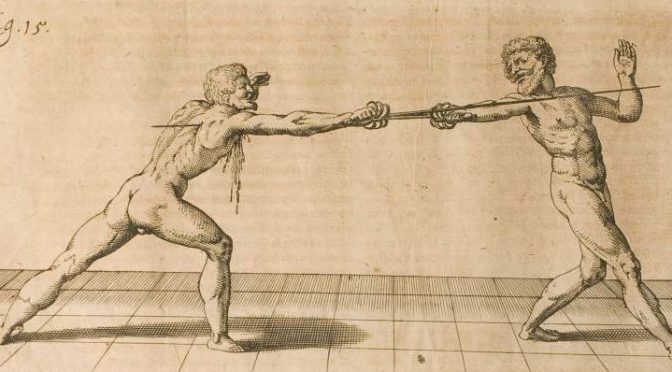 Attacker with spadone, opponent with single handed sword in Guardi Alta. Opponent traverses right, hitting the spadone downwards with a strong mandritto or fendente. Blow is driven downwards into the ground, attacker typically loses their grip with the front hand. Opponent riposte with a blow to the exposed body or head. Attacker throws mandritto to the opponent's sword wrist from Right Guard, Point Behind. Opponent traverses right, attempting to hit the spadone downwards with a strong mandritto or fendente. Attacker hits to the hand with the original mandritto by redirecting the blow sideways, and then reboubles with a second blow. Opponent takes the hits, and the attacker retreats out of distance. Attacking at the sword wrist just shuts down the strong cut out of Guardia Alta. I even saw a few times students throwing the initial attack a bit slower to encourage the counterattack, just so that they could redirect the cut into the wrist as the opponent started to throw their blow. It really brought home that the spadone user can't just be a guy relying on force to win, they can also be really smart about it. What if I Attack into the Cut With an Extended Thrust? It was at this point that one of my students came up with the clever idea of using the counterthrust to attack into the cut from the spadone wielder. The thinking being that the extended point would give the reach to defeat the attack from the spadone. Opponent passes forward and left, counterthrusting in Guardia di Faccia with the the edge turned upwards to close the line as they hit. Attacker takes the hit, with the opponent withdrawing back and right behind the extended point. Seems easy when you write it, but the opponent needed to really commit to the closing action. Most of the time the spadone wielder would subconsciously redirect their cut inwards collecting the incoming thrust and still hitting the opponent without being hit. So we changed up the footwork to give the opponent extra tempo through am increase in measure. Opponent slips back closing the inside line with a mezzo mandritto, immediately following with step in thrusting to the chest or head as the spadone passes through to the ground. As the opponent slips back, the attacker also slips back changing the mandritto into a single handed thrust by letting go with the right hand. Opponent takes hit either directly or as they start to move forward with their attack. Attacker retreats back, pulling the spadone back into a point forward guard. The students taking the role of the swordsman all quickly found they couldn't stop the thrust single from the spadone. The biggest complaint was the lack of time to react, with the spadone just moving too fast to prevent the thrust from landing. The guy with the spadone has a huge advantage in reach, leverage, momentum and initiative. The guy with the sword is at a major disadvantage, especially if the spadone guy is sensible with his actions. As we saw, the clever man can easily deal with anything the guy with a sword can throw at you, which just goes to point out why the spadone was such an effective battlefield weapon. This lesson builds on Lesson 4 where we used the initial imbroccata thrust as a feint. This time we'll be using the same sort of action as a provocation, with the action setting up the molinetto in 2nd intention. The imbrocatta thrust from either the point forward or hanging guards can be readily turned into a redoubled cut. We can use this imbrocatta action to provoke a response from our opponent, opening them up for the redoubled cut. Note: These two static footwork drills allow the students to learn how to turn the thrust into a cut. This is a moving drill designed to teach the student to flow the thrust into the cut, and then into a hanging guard in defence. Drop the tip and using the momentum to turn a circular riverso to the head on the left step forward. Make sure the step forward is made in a true time with the forward motion of the riverso. If space is limited turn to face the opposite direction in Left Guard, Point Forward and instead throw a riverso combination followed by a mandritto combination. This is a limited target drill, where the targets are restricted to the head and forearms. Each fencer is using the spadone simulators, since we don't generally have enough protective armour to use the steel blunts. This bouting exercise is designed to teach the spadone wielder to use redoubled cuts against multiple opponents. Since the spadone wielder is using a shinai simulator, we used boffer swords instead to simulate the relative weakness the single handed swords have against the spadone. The inquartata is our first introduction to the concept of counterattacks, as well as being a characterisically Italian fencing action. The inquartata is a body voiding action, that simultaneously closes the inside line as we move our body towards the outside. When done properly it almost looks like the sword has stayed stationary in space, and we've moved our body behind it to close the inside line. For teaching purposes, I primarily teach the more classical style of inquartata which looks like an angled reverse lunge. The inquartata demonstrated by Giganti is what I call the volta, as a way of differentiating the form. The main reason for teaching the later classical form is that it helps the student understand the timing of the action, allowing them to build up to the full volta shown by Giganti. I've found that by starting with the classical version, students are much less likely to be counterhit (a very common problem when you get the timing wrong) when you perform the full volta style inquartata. This is the initial teaching action, where we teach the actual sequence of the counterattack in response to the high inside gain of the sword by the opponent. Student will invite a thrust to the inside line (Invitation in 3rd). Opponent will make a direct thrust on a lunge to the student's high inside line. As the opponent begins, the student will gain and glide to the inside (parry 4th), stepping with inquartata, hitting to the face. The inquartata step is where the rear foot steps backwards and to the side at 45º as the front knee bends, forming the lunge position with the legs. The inquartata can also be performed as an indirect counterattack, where we invite the opponent to first gain our sword and then respond wih a cavazione and inquartata. Student extends the sword in the high outside line, inviting the opponent to gain on the high outside line (Gain in 3rd). Opponent gains the sword in 3rd, and then attacks with a thrust by glide to the high outside line. As the opponent begins the glide, the student will cavazione counter-clockwise to gain on the high inside line (disengage under the sword), stepping with inquartata, hitting to the face. 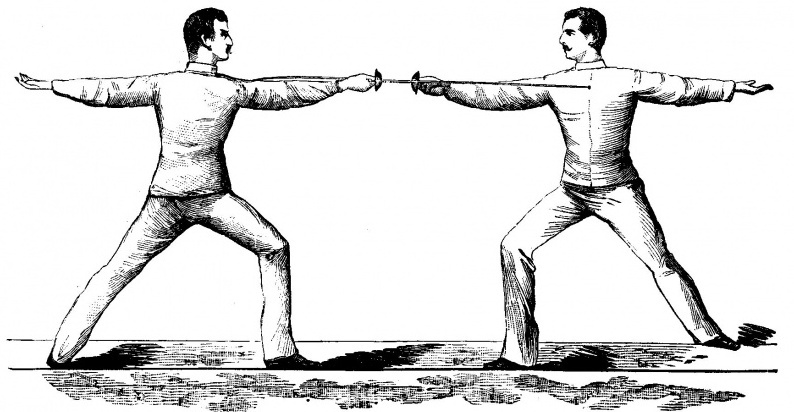 The indirect inquartata can also be performed with the cavazione over the opponent's sword. As the opponent begins the glide, the student will cavazione clockwise to gain on the low inside line (disengage over the sword), stepping with inquartata, hitting to the chest with sword hilt raised (point under their hilt). Trattato teorico-pratico della Scherma di Spada e Sciabola di Masaniello Parise, Tipografia Nazionale, Roma 1884.